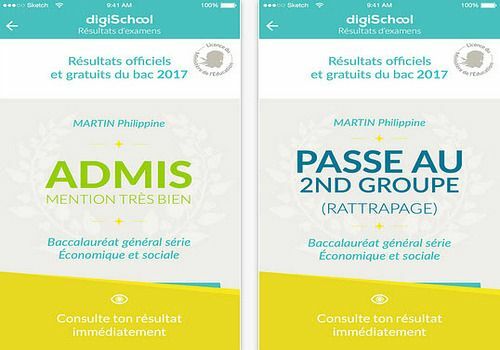 Download the free Android Test Results application to your smartphone and tablet, and be the first to discover the results of the college diploma and baccalaureate on the day. Easy to use, this application notifies you of the official publication of the results according to your acedemia. To do so, simply enter your first and last name, e-mail address, type of exam and date of birth. Once the form has been validated, all you have to do is wait for the app to start to see your notes on the Internet. Examination results proposes the results by academy. In addition to learning whether or not you have passed your exam, you can also view your marks by subject. This is a definite advantage for high school students who are going to catch up since they can use these results to choose the subjects to be taken orally. Obviously, this application is a quick way to see your results but it does not replace in any way only the movement of students to the results centre where they must pick up their report card and especially register for rattrapges, for those who go there. Learning while having fun is the concept of the iOS iTooch Holiday Notebook application that offers children in fourth and fifth grade a multitude of fun and entertaining activities to review last year's school program. A good way to prepare for the new school year in style, without having to worry about it. Download Holiday Books - CP, CE1, CE2, CM1, CM2 Android on your smartphone and touch pad, and give your children a helping hand to review last year's program. From French to history and geography, including math, he will fill his gaps before the start of the school year. Give your children every chance to start the school year in style with the Holiday Notebook application, available for children from CP to CM2 on iOS. Produced by teachers, it presents last year's entire programme in the form of a game. ExoNathan French CM1 Android is one of the best applications to have your children review last year's curriculum. With more than 1000 French exercises, your toddler will become a spelling expert and will know all his grammar rules at his fingertips. With ExoNathan French CM1 iOS, your child's revisions are done with joy and good humour. This application presents 1000 fun and entertaining exercises designed to help children progress in spelling, grammar, and conjugation while entertaining them.